In the clear, Mikko Rantanen angled his stick back as he waited for the cross-ice pass to arrive. Once it did, he dropped to his left knee to give a little extra. Moments after weathering a penalty, captain Gabriel Landeskog started the rush down the ice and sent a pass over to Carl Soderberg. From there, Soderberg slid the puck over to a wide-open Rantanen, who lined a shot past Mike Smith. 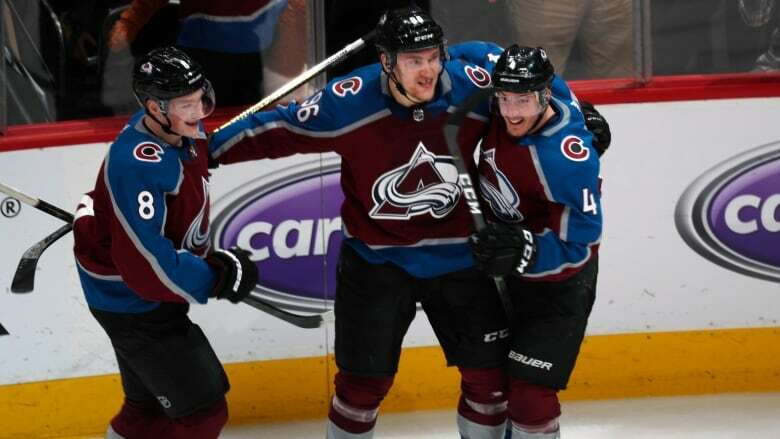 "Carl made an unreal pass so just tried to get it to the net and it went in," said Rantanen, who missed the final eight games of the regular season as he dealt with an upper-body injury. "Great team effort." Colorado trailed 2-0 in the third period, with J.T. Compher starting the comeback on a goal off a rebound and Rantanen tying it on a power-play goal with 2:50 left. Elias Lindholm and Derek Ryan had goals for the Flames, the top seed in the West. They face a must-win scenario when the series returns to Calgary for Game 5 on Friday. The Flames are trying to avoid a similar fate as Tampa Bay, the No. 1 seed in the East who lost to Columbus in the first round. "It's disappointing anytime you lose," Calgary coach Bill Peters said. "We've got to go home and play our best game in Game 5. That's what we have to do." Philipp Grubauer stopped 35 shots, but none bigger than his one in OT. Sprawled on the ice and facing Mikael Backlund with the puck on his stick down low, Grubauer waited a split second. Then he slightly raised his left pad just as Backlund shot it. The puck hit the middle of Grubauer's pad. "He made a good read," Backlund said. "Good save." Grubauer had another term for it. "Desperation save," he said. "It was not the best, but we got it done." Smith had another busy night in stopping 49 of 52 shots. He saved 50 of 56 in a 6-2 loss in Game 3. The 37-year-old Smith took a skate to his leg when Avalanche forward Colin Wilson slid into him in the first period. Smith was briefly checked out before settling into a groove. "This one stings," Smith said, "especially when you have the lead with 10 minutes left in the third." Compher had a breakaway in overtime and Smith gambled by coming out of the net to challenge him. Compher got around Smith, only to send the puck wide. Later, Colorado withstood a penalty on Ian Cole for a delay after the defenceman sent the puck out of play on a clear. "We stuck with it. We didn't panic," Compher said. "We kept playing our game." Calgary was seemingly in control after Ryan extended the lead to 2-0 with 13:02 remaining after batting in a rebound. Just over a minute later, Compher sent a shot past Smith following a scramble in front of the net. Then, Rantanen tipped in a shot to tie it up. Lindholm scored his first goal of the series at 3:25 of the second period. His goal arrived just six seconds after Erik Johnson took a penalty for high sticking. The Flames have at least one power-play goal in all four contests. Shortly after Lindholm's goal, Smith made a diving save with his left arm on a shot from Landeskog. And shortly after that, Landeskog clanged a shot off the post. This certainly caught the attention of Colorado: Columbus upsetting top-seeded Tampa Bay in an Eastern Conference first-round series. The Avs are hoping to follow suit against the Flames. "It doesn't happen often," said Rantanen," who notched his first playoff overtime goal. "In the NHL, it can happen. The differences are not huge."